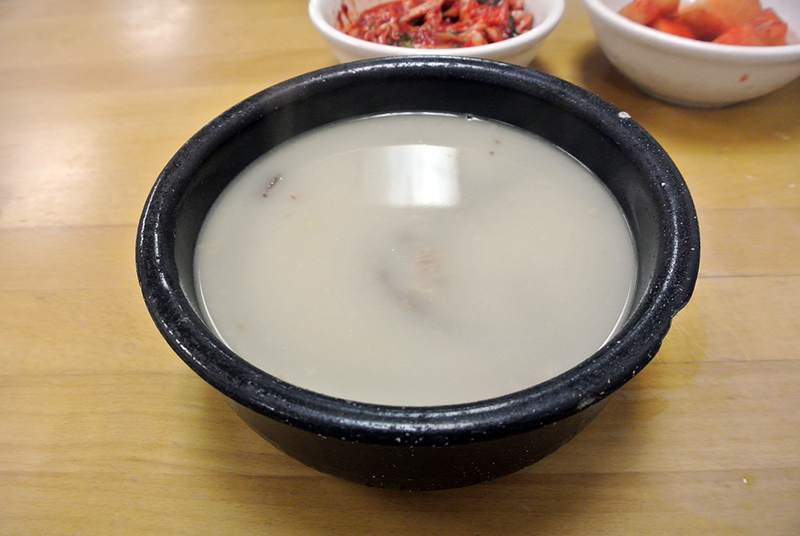 Sul Lung Tang is a bare-bones (pun intended) Korean soup ideal for colds and cold weather. Its origin can be traced back to the Joseon Dynasty under the rule of King Seonjong, who asked his people to come up with dishes that could feed large numbers of people with minimum ingredients. The tang‘s base comes from slowly boiling beef bones for hours (sometimes all day) until all of the beefy essence has been extracted into a milky white liquid. The resulting broth doesn’t have the complexity of Japanese ramen, but is instead something simpler and homey along the lines of a basic chicken noodle soup. Los Angeles’ most popular purveyor of sul lung tang is Han Bat, a tiny, no-nonsense restaurant located on 5th street just west of Western. The menu offers only two options – beef soup and boiled beef – which you can have with your choice of beef parts. First timers are advised to stick with the brisket, while the more adventurous go for the “mixed” which includes intestines, tripe, spleen, and more. Almost immediately after being seated the waitress will ask for your order; it should be an easy decision, so make it quick before she turns her attention to another table. Along with the bowl of soup you’ll also get kimchi, kkakdugi (pickled daikon radish), and a bowl of rice. 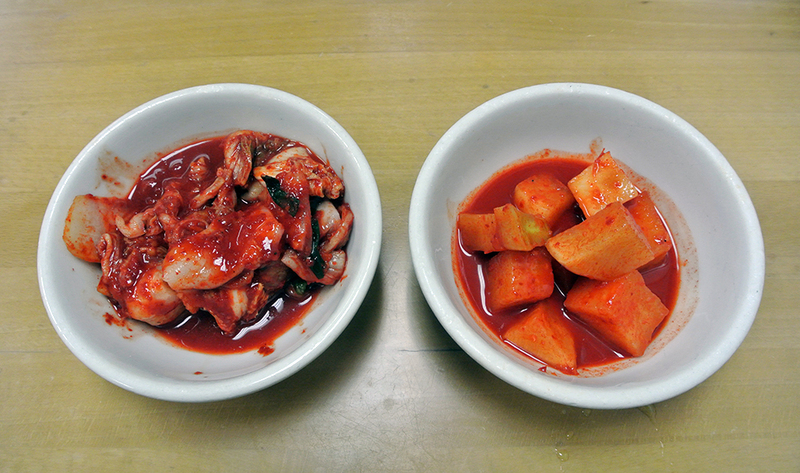 Both the kimchi and pickled daikon are solid, exhibiting the right amount of spiciness and fermented funk. 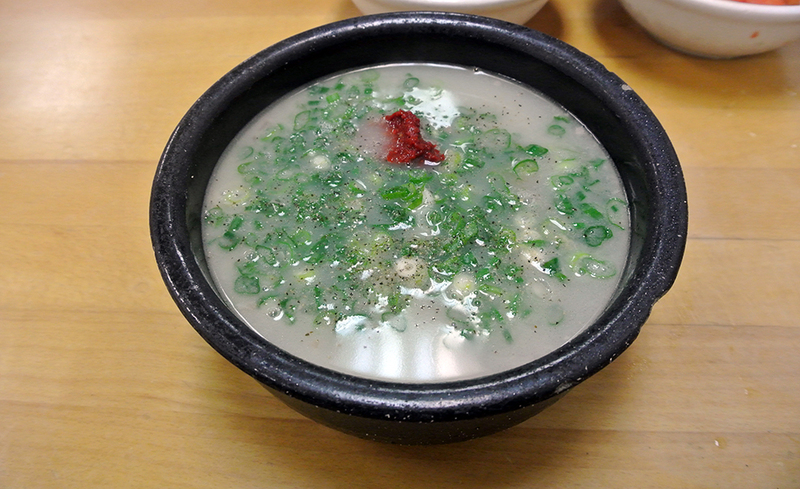 The rice can be eaten in between spoonfuls of broth, or mixed in directly to create a porridge of sorts. 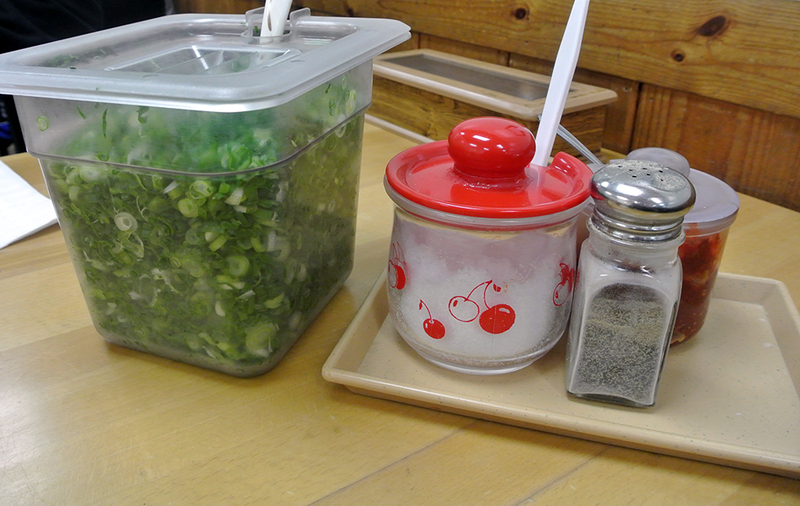 Also on the table are containers of chopped green onions, a kimchi “paste”, and salt and pepper, all meant to season the sul lung tang to each patron’s preference. I found it most effective to season as I went, adding more scallions and heat as necessary. The sul lung tang arrived (after no more than a minute or two) looking like this, the cloudy broth obscuring the slices of tender brisket and strands of translucent noodles lurking beneath the surface. At this point the taste was very clean with a rich beefiness to it, but expectedly plain overall in terms of flavor. Once all the accoutrements are added, the sul lung tang really begins to take shape. The salt and pepper served to enhance the broth’s beefy base, while the scallions, which I found myself re-adding several times, contributed a nice crunch and slight bitterness. The red “paste” delivered some sweat-inducing spice and turned the soup’s color to a pinkish-red hue, and I also saw other tables adding pieces of kimchi directly to their bowls. Although sul lung tang is a common enough dish that can be found at plenty of Korean restaurants, nobody seems to treat it with the same care and reverence as Han Bat. Other places may advertise more noodles, or a clearer broth, but for my money there just isn’t a better rendition anywhere in the city, except perhaps the kitchen of some near and dear Korean mother.